Bank tellers are the key point of customer contact in bank branches, involving the processing of a variety of transactions. Becoming a teller can serve as an entry-level position in banking, and can help facilitate entry into higher paying career paths within financial services. However, this is the exception rather than the rule. Few tellers actually are considered seriously as candidates for promotion by their current employers. The total number of jobs for tellers tend to follow cyclical patterns, as major banks embark on successive periods of expansion or contraction in the number of their branches. The recent trend toward mergers and consolidation of the banking industry (accelerated by the 2006-07 mortgage crisis) caused the total number of bank teller jobs in the U.S. to fall 11.2% between 2008 and 2012, from 600,500 to 545,300. Nonetheless, employment prospects for bank tellers are expected to be excellent for the foreseeable future, primarily because the field has a long history of high turnover. 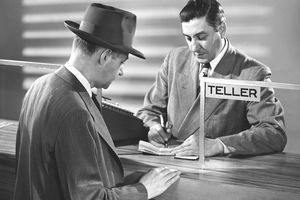 While the Bureau of Labor Statistics (BLS), forecasts that jobs for tellers will expand by a mere 5,600 positions (1%) in the decade from 2012 to 2022, the high churn rate among tellers means that many positions are constantly coming open. Use this indeed.com search tool to find current job openings in this field. Education: In general, a high school diploma is sufficient, though college graduates are increasingly preferred. Due to the sensitive nature of the job, any blemish on your record that may emerge in a background check can preclude employment as a bank teller. Facility with numbers and skill in arithmetic are musts. Additionally, the increasing computerization of banking operations makes computer literacy highly desirable. Good tellers are comfortable dealing with customers, have strong oral communication skills and are good listeners. Training: In all but the largest banks, the training for bank tellers tends to be strictly on the job, under the tutelage of experienced tellers and/or branch officers (supervisors), with little or no formal classroom instruction. The BLS reports that such training typically lasts about a month. The basic duties of a bank teller include cashing checks, making deposits, processing loan payments and withdrawing funds from customer accounts. Bank tellers also assist customers with opening and closing accounts. The job requires adhering closely to rules and regulations regarding the verification of customers' identities, the accounts and transactions that they are permitted to access or initiate, and the amounts of funds that may be placed at their disposal. Tellers also must adhere to various reporting requirements. The rules and regulations in question are a mix of those set by law or by banking regulators, and those peculiar to the individual bank. In some banks and banking environments, the teller's role may be expanded to assess customers' needs and to market certain products and services to them. Both this aspect of the job and that related to rule enforcement demand a keen sense of judgment, going far beyond a rote adherence to routine. A 40 hour work week is typical, but it can be longer, given the trend for banks to accommodate customers with longer hours, including nights, Saturdays and even Sundays in some cases. The old days of "banker's hours" that stretched only from 9 to 3, Monday to Friday, are long since past. However, also note that today about 33% of tellers work part-time. Those who enjoy working with people can find interacting with customers an enjoyable aspect of the job. It is particularly true for those fortunate enough to become tellers in bank branches with light to moderate levels of customer traffic, in which time pressure is not a major issue. Depending on the bank and on the initiative of the individual, a bank teller job can be a steppingstone to higher-level jobs in banking. The most obvious next step is as an officer (supervisor) within a branch. In very busy urban bank branches, tellers can be under severe pressure and find the job physically and mentally draining. The problem can be compounded if the customer base is demanding and hurried. Under such time pressure, the possibility of making computational errors is enhanced, leading to yet more stress. After the branch closes, depending on the volume of transactions during the day, and the size and efficiency of the staff, the process of proving up tellers' work during the day can be a lengthy and stressful process. Normally, tellers are not allowed to leave for the day until their work is proved up. That is, the cash on hand at the end of the day must equal starting cash plus cash deposits minus cash withdrawals. Likewise, non-cash deposits and withdrawals (by check or electronic transfer) must be checked to ensure that they were accounted for correctly. Furthermore, working as a bank teller does bear some risk of physical danger associated with attempted robberies. The open architecture of many bank branches, with tellers largely exposed to the customers across a counter, adds to the risk. High turnover is spurred by low pay (see the next section). Also, while opportunities for advancement do exist (as stated above), they typically are limited. Median annual wages for bank tellers (BLS occupation code 43-3071.00) were $24,940 as of May 2012, with 90% earning between $19,630 and $34,320. As with all job categories, expect significant geographic pay differentials. More than 90% of tellers earn less than the median annual wage for all occupations, which was $34,750. Meanwhile, nearly 75% of workers in other occupations earn more than the median annual wage for tellers ($24,940).